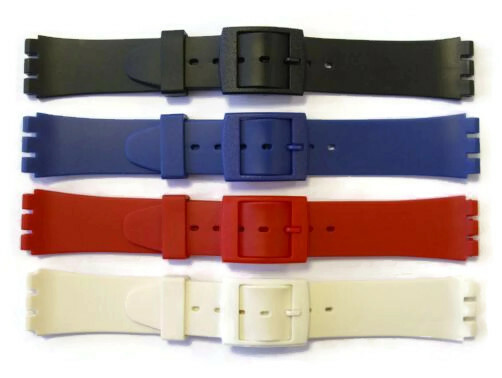 Swatch® fitting compatible watch strap available in a range of colours: Black, Blue, Red, Transparent and White. Pins are not included and the item is not branded. If you have a Swatch® Skin watch, please see our 'Skin' version for the correct watch strap. Once again a perfect, well-priced item, efficient ordering and super-fast delivery. Excellent in every way. Highly recommend. Brilliant service. I ordered the watch straps at 3p.m on Tuesday and the straps arrived first post on Wednesday.They were exactly what I wanted and fit my watch brilliantly. Thank you for the red Swatch watch strap I have just received from you. It is much more flexible than the original strap, which was brittle and only lasted a couple of months before it broke. Your postage charges to Spain are very reasonable.